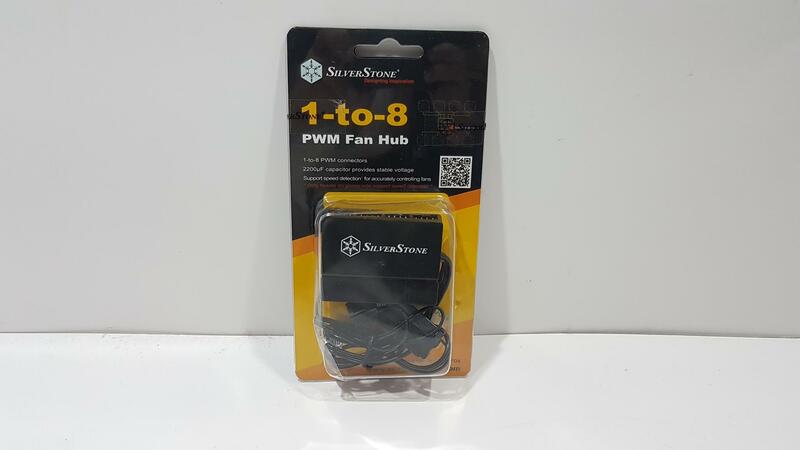 SilverStone has sent us their SST-CPF04 1-to-8 PWM fan hub. This hub allows the user to connect up to 8x PWM fans to this hub which is then connected to a single PWM fan header of the motherboard. 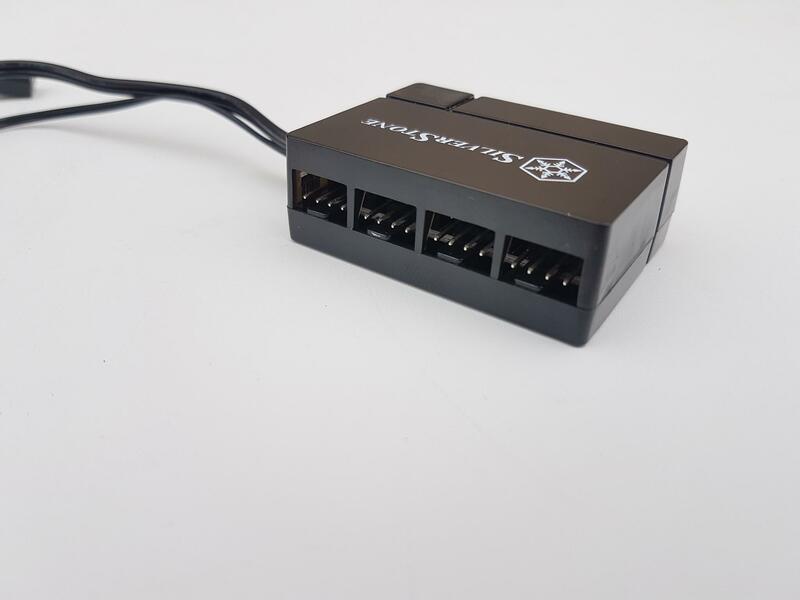 This hub takes power directly from the PUS using SATA connector hence eliminating the power considerations of the motherboard PWM fan header. The power is filtered through a built-in 2200µF capacitor to ensure the stable and clean power supply to the fan headers of this hub. 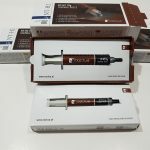 The product is shipped inside a minimal packing which is understandable given the size product and the contents of the box. The paperboard is packed inside a transparent container. 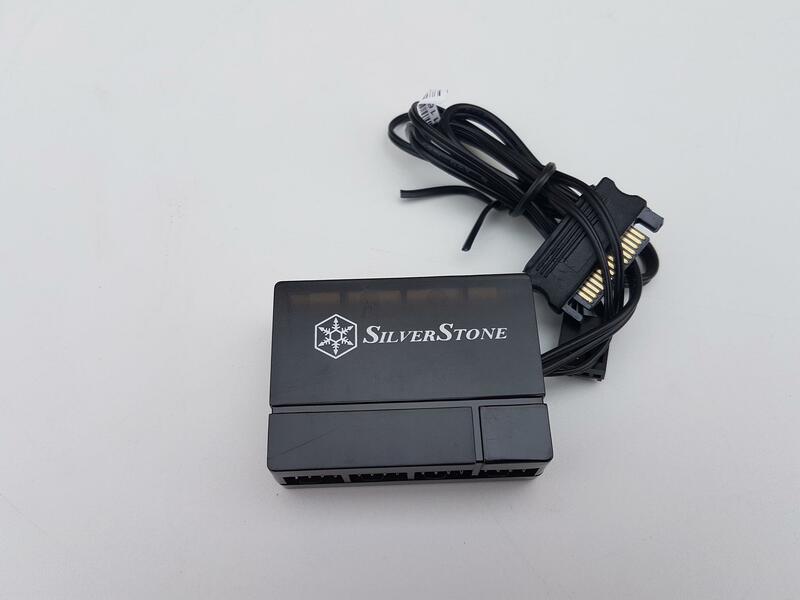 The front side has a SilverStone brand name and logo printed at the top side. 1-to-8 PWM fan hub is printed below the brand name followed by the salient features. The hub and its cables can be seen from the transparent container. 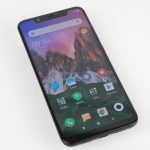 The product’s name and model are printed at the bottom followed by the company’s website address. 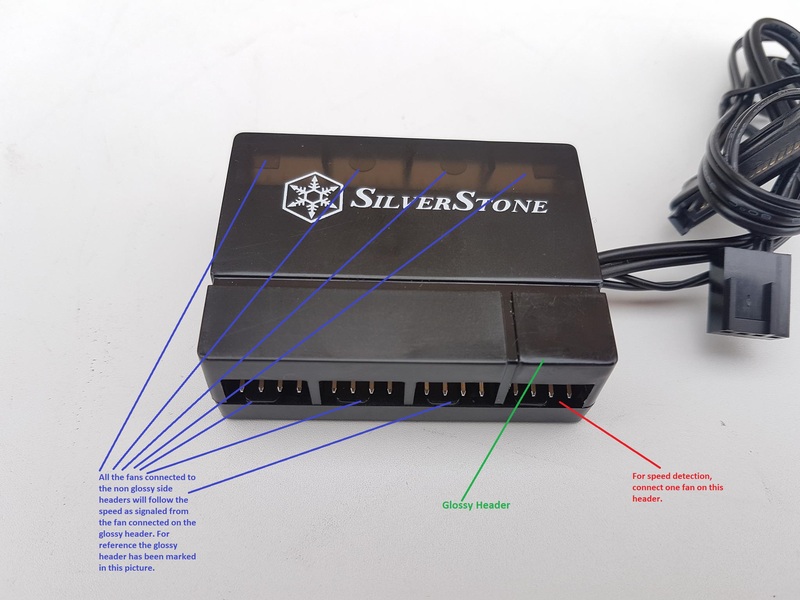 The backside of the box has SilverStone brand name, support email address and the company’s website address printed on the top left side. The specifications of the product are printed in the middle followed by printing of the salient features in 9 different languages. 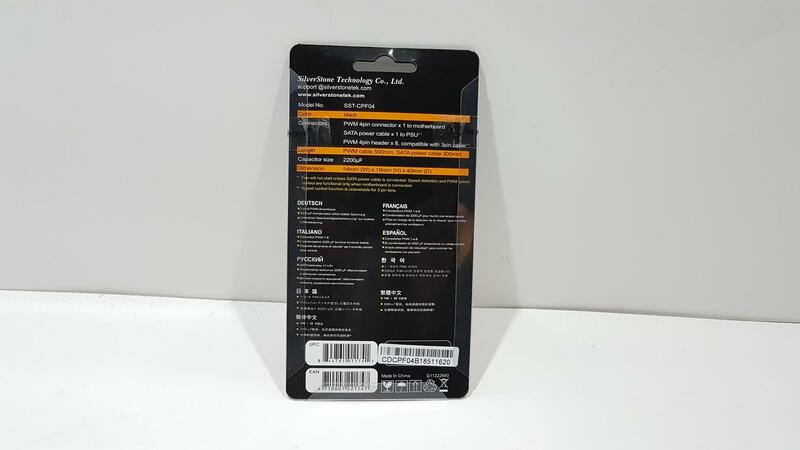 The EAN and UPC info labels are printed at the bottom. A serial no sticker is pasted at the bottom right side. I will be taking a different layout for this content. It will be like a question/answer session. So, let’s start with it. 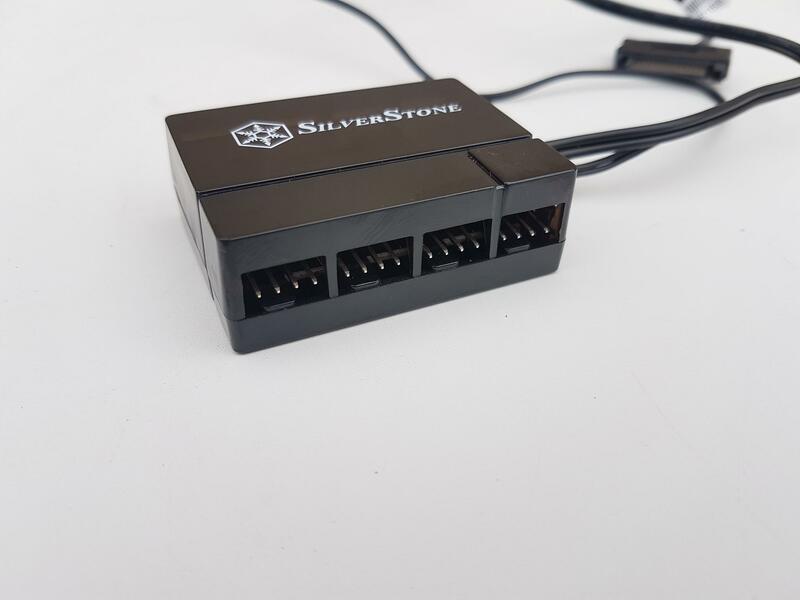 The SilverStone CPF04 is a PWM fan hub that allows the users to connect up to 8 fans depending upon the requirement with a single PWM fan header of the motherboard. The hub takes power directly from the PSU which is filtered through a powerful built-in 2200 µF capacitor to ensure a steady and clean power to the headers. The SST-CPF04 is made of the plastic material. The dimension of the hub is 54x19x40mm (WxHxD). The top side of the hub has a SilverStone brand name and logo printed in the white color in the center. The fan headers are implemented on the sides of the hub with each side having 4 headers. The above pictures show both sides of the fan hub. Each side has 4 4-pin PWM fan headers. The rear side of the hub has a plain and closed surface without any branding or cabling. The above picture shows the side of the hub with two cables coming out of it. One is the SATA power cable having a length of 300mm whereas the other is a PWM cable having a length of the 500mm. The above picture shows both connectors. The PWM cable has only two pins and two wires. The SATA power cable operates at +12V. The reason behind only two wires on the PWM cable is that this cable is supposed to carry the PWM signal to and from the motherboard’s header for speed detection and control. The above picture shows the backside of the hub. There are four raised surfaces or catchers designed in a rectangular cutout manner. This is a visual aid to the user to paste the 3M dual-sided adhesive tape here. The above picture shows exactly what the user is required to do. Peel off the protective sheet on one of the sides of the 3M adhesive tape and paste it on the backside of the hub. Now, decide a proper place inside the chassis and peel off the other side’s protective sheet to paste the hub on the chassis frame. There is no magnet inside the housing of the hub hence magnetic attachment is out of the question. Refer to the above-labeled picture. I am using this picture as an illustration on how to actually set up the SST-CPF04. It is actually that simple. 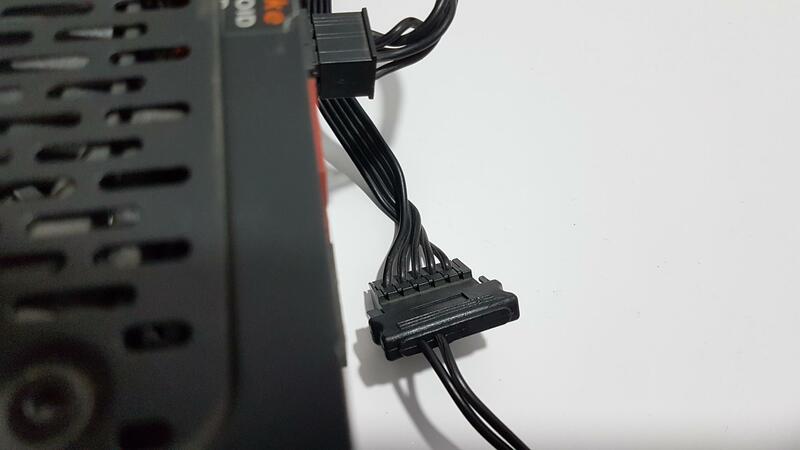 The SATA power cable of the SST-CPF04 is connected directly to the SATA connector coming from the PSU. The PWM cable is connected to a PWM fan header of the motherboard. Rest, connect up to 8 fans to the hub and that would be all. The above picture shows the PWM cable of the SST-CPF04 connected to the motherboard’s PWM fan header. The above picture shows the SATA power cable of the SST-CPF04 connected to the PSU. The above picture shows the 8 Alphacool Eiswind 12 fans connected to the SST-CPF04. In continuation of the above illustration on how to set up the SST-CPF04, the working is quite simple. 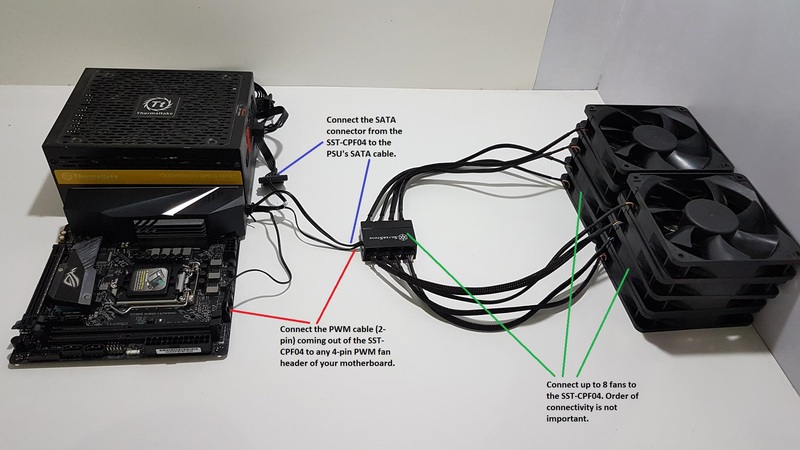 Once, you have connected the required no of the fans to the hub, hub’s PWM cable to the motherboard and hub’s SATA power cable to the PSU, turn on the system. You should be able to see the reported speed of a fan in the BIOS or in the fan control/monitoring software. All that you need to do is to define the fan curve as per your requirement and SST-CPF04 will take care of the job. All the connected fans will rotate as per the speed signal coming through the PWM cable of the hub. This is quite a convenient implementation. So, the question is what the use of the CPF04 is and who actually needs it. Generally, the motherboard has a few fan headers in addition to the dedicated CPU_Fan header. Majority of these headers are rated at 1A using 12V with the exception of HiAmp headers which can have up to 3A per header or whatever the stated specifications of that particular motherboard is. 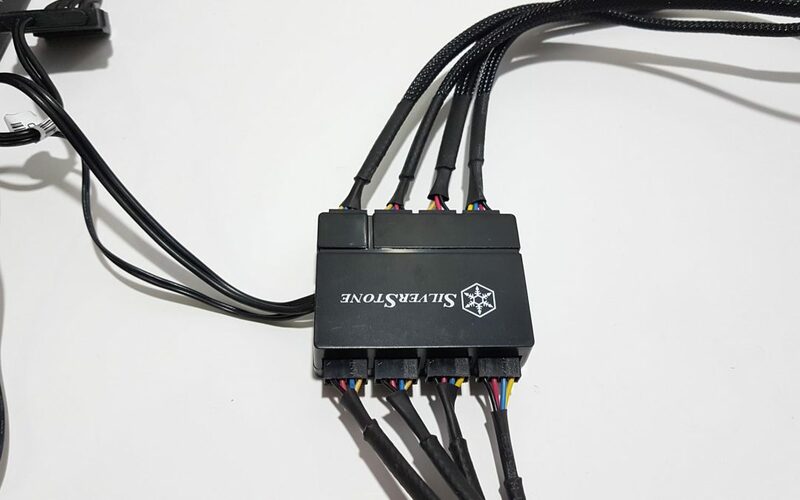 The user has the option to connect 2-3 fans per header as long as the combined power requirement of the connected fans remains within the power specification of that fan header otherwise you may end up damaging your motherboard and fan(s) or either. 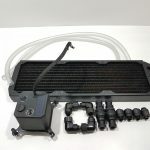 For water cooling enthusiasts who may be using multiple radiators at once, the motherboard fan headers might not be the complete solution as they may run out of the headers before running out of the fans to be connected particularly when the no of the fans is high. Also, they may want to combine, say 6 fans, in a single group. They can’t or may not do that on a single fan header of the motherboard. This is where the dedicated fan hubs with multiple fans connectivity options come handy. 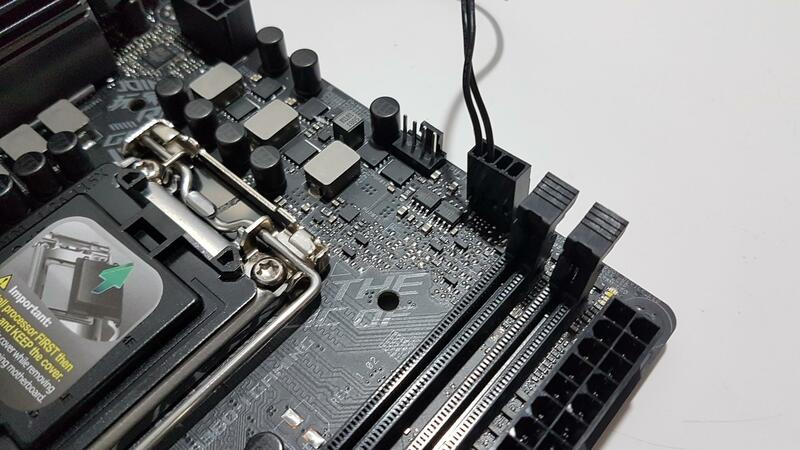 Since CPF04 is using a dedicated power source and not taking or relying on the motherboard’s fan header to draw power, the user has a peace of mind from power consumption related calculations and/or risk of damaging the motherboard/fan(s). The user will connect the 6 fans to the SST-CPF04 and connects its PWM cable on any PWM fan header of the motherboard. This way the user will be able to control 6 connected fans in a group. While this sounds like a blessing, it is equally a limitation as well because there is no way to control the individual fans that are connected to the hub. What is the Power rating of the SST-CPF04? I have seen many persons asking what the rated current is and voltage per header or combined for the SST-CPF04. 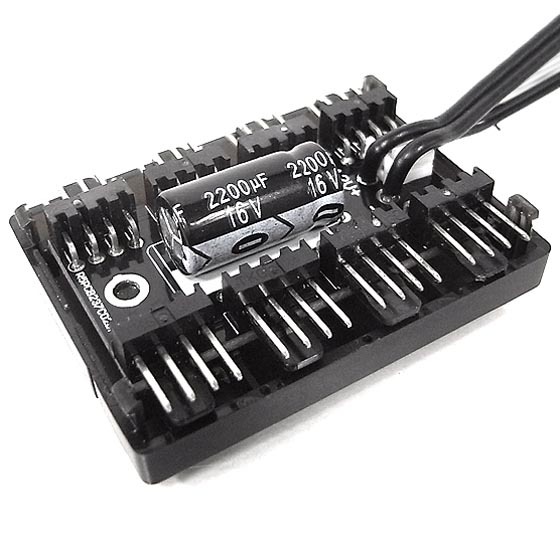 Since the SST-CPF04 is drawing power directly from the SATA connector of the PSU, it has a rated current of 4.5Amps maximum per header as well as combined. It is simple math for the Watts rating. Multiplying 12V with 4.5Amps would yield the 54Watts per header and combined as well. 54W is plentiful power rating to operate any type of the PC fan. Using a 2200µF capacitor will ensure the clean and steady power supply to the fan headers of the hub. How many fans can be connected to the hub at a time? The user can connect up to 8 fans to the SST-CPF04. How does the speed detection work? This is a critical question that needs to be addressed. This hub has a glossy header on one side. The speed of the fan connected to this header will be registered in the BIOS and fan control/monitoring software. The above picture has been labeled for better understanding. Let’s suppose we have connected 8 fans to the header and want to control their speed from the BIOS. The fan connected on the glossy header (highlighted in the picture) will be registered in the BIOS. All other fans (7 in our example) will operate on the same speed as being set for the fan connected to the glossy header. The PWM cable of the hub will report the tach or the speed of the fan to and from. Do we need speed detection? For users like me who always want to exercise full control of the fans, speed detection is a must. For some, it might not be the case as they would just want to run their fans at the full speed all the time in which case speed detection is of little to no concern for such users. At what speed the fans will operate by default? The answer to this question is not straight forward as the fan speed settings of the motherboard’s fan header would determine the speed of the fans connected to the fan hub. In my testing, the motherboard’s fan header was set to run the fans at 70% of their rated speed. As soon as the hub was powered on, the connected fans were operating at 70%. Can 3-pin fans be used with the SST-CPF04? 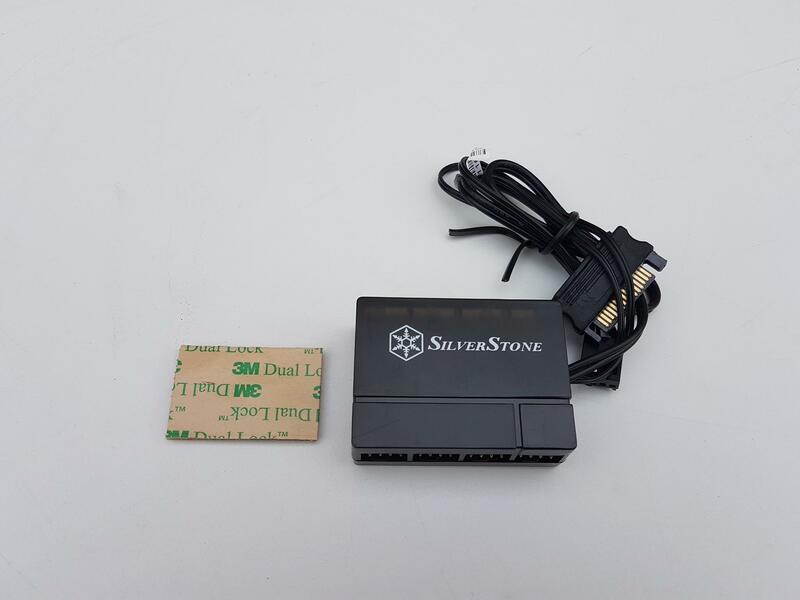 The user can connect the 3-pin fans with the SST-CPF04 but these fans will run at their full speed at all the times as you won’t be able to regulate the speed of these 3-pin fans. Why? The hub operates on PWM regulation to control the speed of the fans. 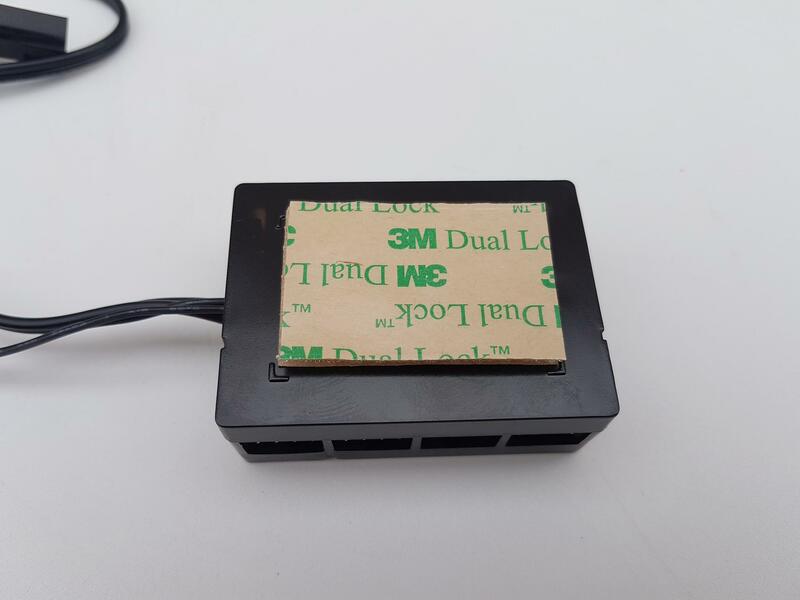 The PWM regulation is done at 12V and 0V at all the times to control the duty cycles whereas 3-pin fans can be regulated by modding the voltage levels i.e 5V, 7V and so on for example. Since we are not regulating the voltage in discrete steps in the PWM hence one can’t control the 3-pin fan’s speed on this PWM hub. 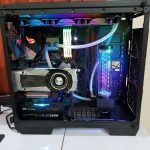 I have tested it on the SST-CPF04 using the Thermaltake Riing 12 fan. This fan is using a 3-pin connector to control the speed. This fan is rated for 1500 RPM maximum. I connected the fan to the glossy fan header of the SST-CPF04 and powered it up. The PWM cable of the hub was connected to the same fan header that has been used for all the other testing of this content. The above picture is showing the speed of the Thermaltake Riing 12 fan as shown in the BIOS. It is rotating at 1461 RPM (within ±10% margin). I tried to change the fan header’s settings in the BIOS hoping to regulate the speed but there was no change in the speed and this is how the SST-CPF04 should have operated and it did. I also changed the header control to be DC from the PWM to no effect. Knowing that none of what I did above matters, I did it to give you guys a better understanding of what you should expect from this hub. 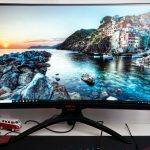 How do we know if the fans are actually working at the set speed? The above testing is clearly indicating that there is no performance loss by connecting and using 8x fans to the hub much thanks to the dedicated SATA power cable and the 2200µF capacitor for clean and steady power supply. The above picture is showing the fan header setting to run the fans at 100% of their speed. The reported RPM of 1726 is a clear indicator that the fans are operating at their full speed. The above picture is showing the fan header setting to run the fans at 70% of their speed. The reported RPM of 1433 is a clear indicator that the fans are responding to the change in speed. The above picture is showing the fan header setting to run the fans at 100% of their speed. The reported RPM of 1195 is a clear indicator that the fans are responding to the change in speed. The above picture is showing the fan header setting to run the fans at 100% of their speed. The reported RPM of 967 is a clear indicator that the fans are responding to the change in speed. The above picture is showing the fan header setting to run the fans at 100% of their speed. The reported RPM of 843 is a clear indicator that the fans are responding to the change in speed. Can fans of different speed be used with the SST-CPF04? Yes, you can use fans with different rated speeds with the SST-CPF04. The more logical question in conjunction with the above one is at what speeds these fans operate at. 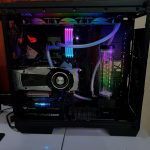 To answer these questions, I connected the Noctua NF-A14 iPPC 3000 PWM fan along with 5x Alphacool Eiswind 12 fans. 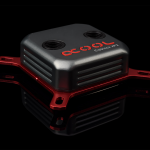 I have already mentioned above that the rated speed of the Alphacool Eiswind 12 is 1700 RPM ± 10% and that the rated CFM of these fans is 63.85 CFM. The Noctua NF-A14 iPPC 3000 PWM is rated at 3000 RPM with 158.617 CFM. The Alphacool Eiswind 12 fan was connected to the glossy fan header. Before connecting the Noctua fan to the SST-CPF04, it was directly connected to the motherboard’s fan header and it was set to work at 100% of the speed. The air flow was recorded using an anemometer. Then the Noctua fan was connected to the SST-CPF04. 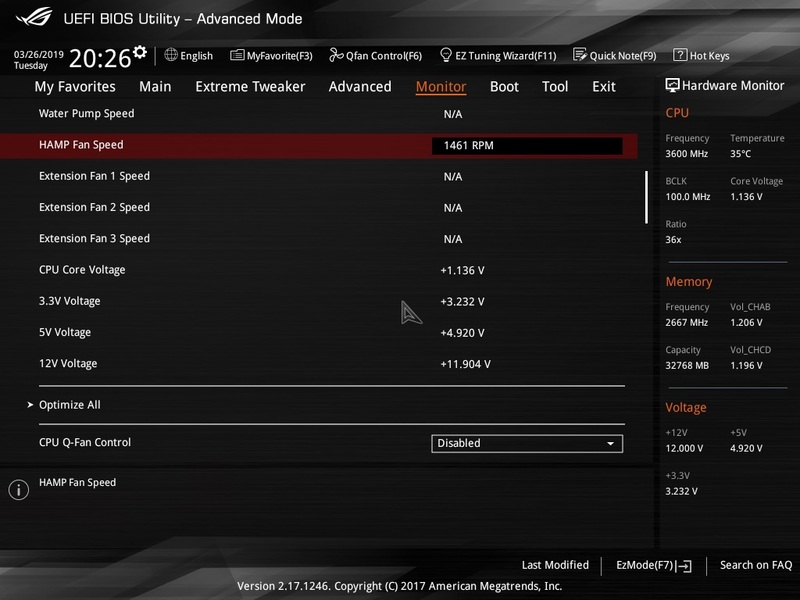 The BIOS was showing the 1726 RPM which is the rated speed of the Alphacool Eiswind 12 fan. This is what I was expecting because the Alphacool Eiswind 12 was connected to the glossy fan header. So, what about the speed on the Noctua NF-A14 iPPC 3000 PWM fan? It was for sure operating at maximum speed from the sound of it. The above results are clearly indicating that both fans were operating at their maximum rated speed which is within the ±10% margin. So, here is what can be drawn from the testing. You can use different speed fans with the SST-CPF04 but their speed will vary at the respective PWM duty cycle. Put simply, at 50% the fans will operate at the 50% of their respective rated speeds, at 100% the fans will operate at 100% of their respective rated speeds. Can 3-pin and 4-pin fans be used together? 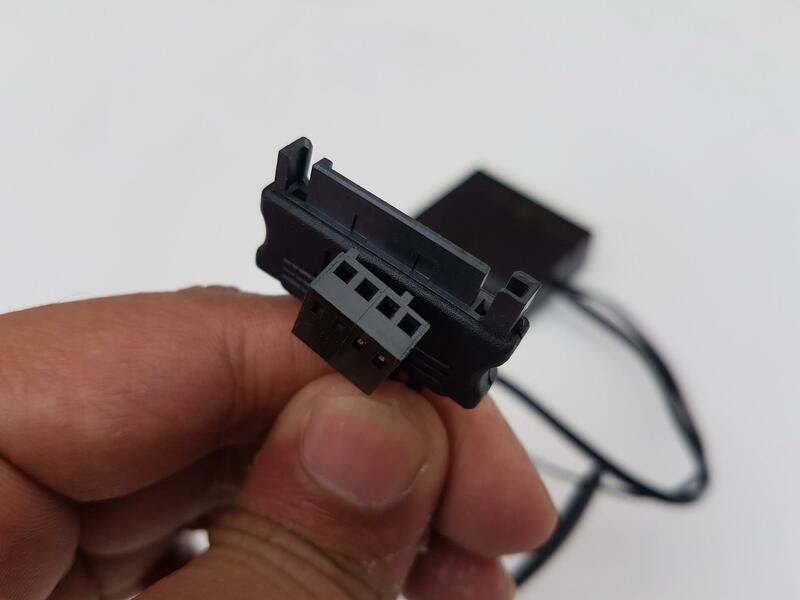 Yes, the user can use the 3-pin and 4-pin fans together but the 3-pin fans will operate at their maximum speed which can’t be regulated however, you will have full control over the 4-pin fans. I tested this with a Thermaltake Riing 12 fan and 5x Alphacool Eiswind 12 fans. Can 2-pin fans be used and regulated with the SST-CPF04? The user can connect the 2-pin fans with the SST-CPF04 but they will operate at their full speed with no speed regulation. My water pump has a 3-pin connector. Can I control its speed with the SST-CPF04? Simply put, no, you can’t. For more information, please read the related question above. 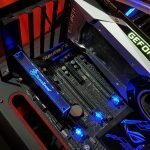 Will the fans work without plugging the SATA cable? 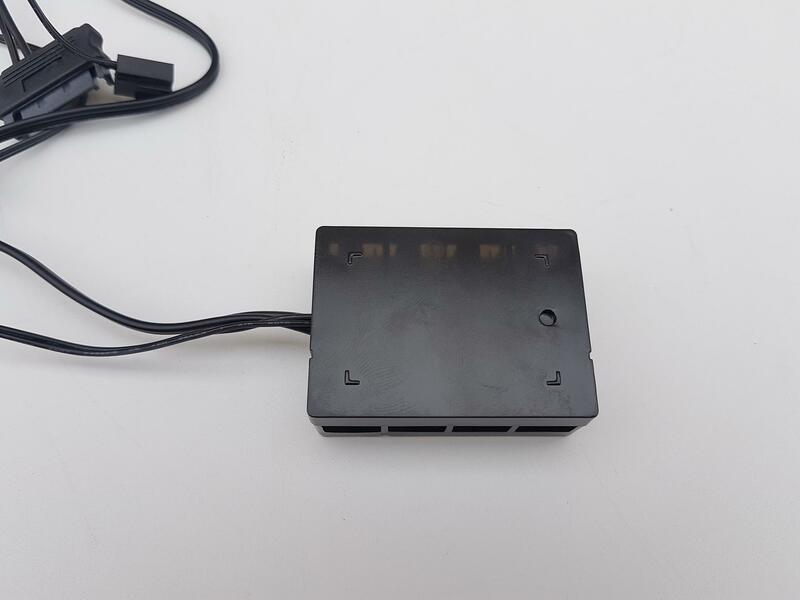 Since the SST-CPF04 draw power directly from the PSU using the SATA cable, the fans will not power up until the SATA cable of the hub is connected to the PSU. This is regardless if the PWM cable is connected to the motherboard’s fan header or not. If the PWM cable is not connected then the connected fans will operate at full speed. 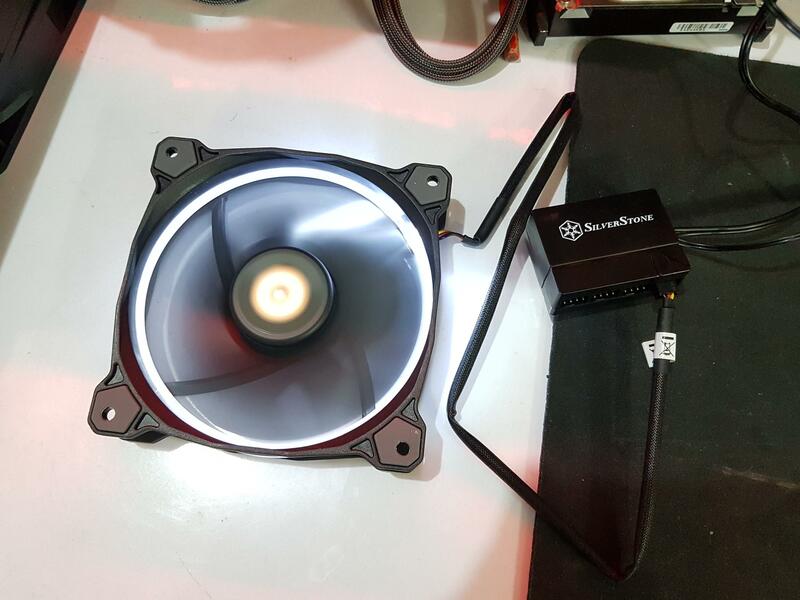 Will SST-CPF04 light up the LED fans as well? The sole purpose of the SST-CPF04 is to power up the fans to make them spin. The LED fans have a dedicated LED power cable on them. You will still need to connect the LED power cable to the appropriate source. If the LED fan has the LED power and the fan’s motor power combined on a single power then the LED will light up. Make sure to read the fan’s LED power rating in that case. 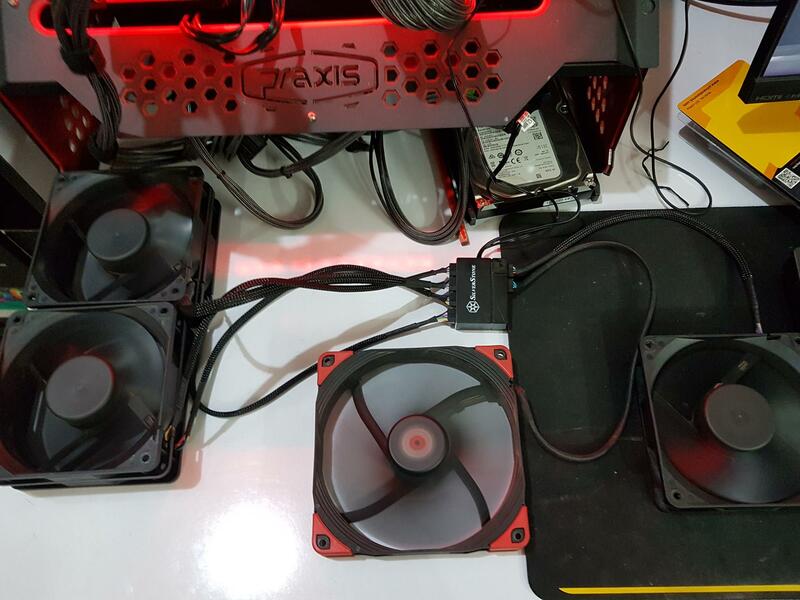 I tested the Thermaltake Riing 12 fans which only have a 3-pin fan connector to power up the fan and the LED. The fan light up when connected to the SST-CPF04. The SST-CPF04 is designed for enthusiasts with a need for controlling numerous system fans. It is capable of expanding one motherboard PWM fan header to support up to eight fans. Powered directly by SATA cable from the computer power supply and filtered through a built-in 2200µF capacitor, the SST-CPF04 can provide clean, stable voltage to any fan for optimal performance. 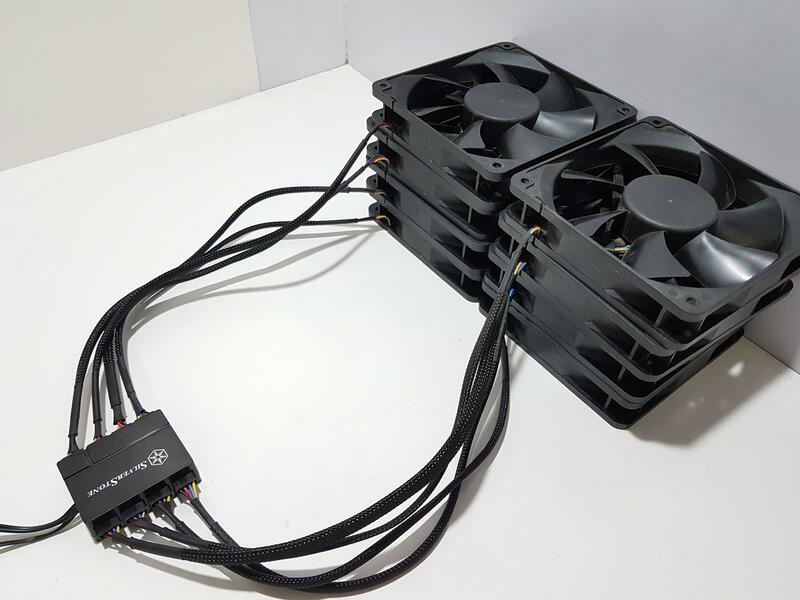 Equipped with speed detection sensors for accurately controlling up to 8x PWM fans simultaneously, it is an excellent solution for system fan expansion. The SST-CPF04 is made of the plastic material. The dimension of the hub is 54x19x40mm (WxHxD). The top side of the hub has a SilverStone brand name and logo printed in the white color in the center. Both sides of the hub have 4x 4-pin PWM fan headers on them. There is a header with a glossy frame around it indicating that the fan connected to this header will be used to relay the PWM signal to and from the motherboard. The rest of the connected fans will follow the speed duty cycles coming from this header. 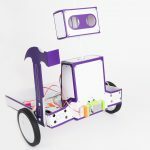 There is no magnet inside the housing of the hub hence there is only one way to attach this hub with the chassis frame which is using the bundled dual-sided 3M adhesive tape. There are two cables coming out of the hub for the connectivity. One is the 500mm PWM signal cable and the other is the 300mm SATA power cable. The hub draws power directly from the PSU which would mean we have 4.5Amps at 12V per header and combined as well. This would give us 54W of the power which is plentiful for any powerful PC fan out there as long as the specifications fall within the power rating. 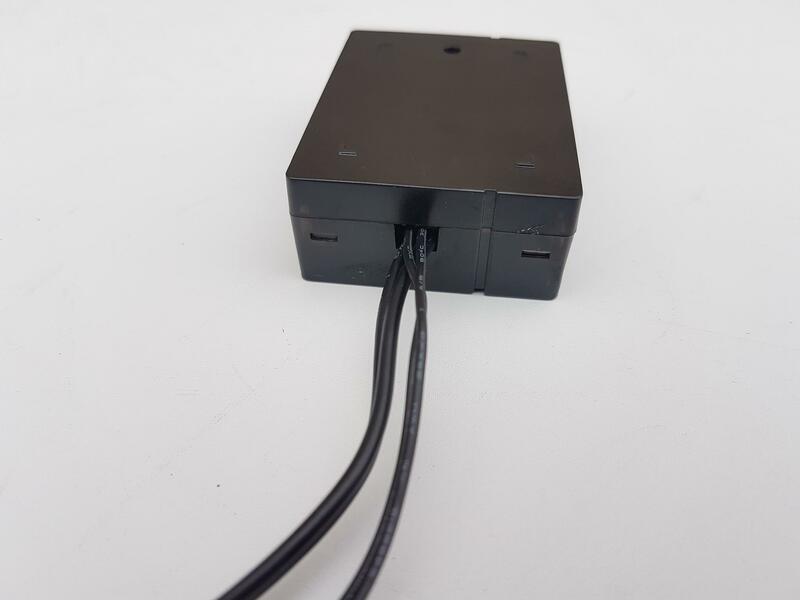 All that the user is required to set up the SST-CPF04 is to connect the fans to the hub, connect its PWM cable to the PWM fan header of the motherboard and connecting its SATA power cable to the PSU. This is it! The sensor of the hub is working near accurate and I never observed any hitch during the operations. The fans were crossing their rated speeds and were within their ±10 margin of error. I have tested the unit with different speed fans, same speed fans, different connectors (3-pin, 4-pin). Since this hub is PWM it can’t regulate the 2-pin or 3-pin fan/pump and all the 2-pin/3-pin fans/pump will operate at their maximum speed. If the PWM cable of the unit is connected then the 4-pin fans will also operate at their maximum speed otherwise they will follow the PWM signal coming from the motherboard’s PWM fan header. Please, read the content above for more detailed information. The SST-CPF04 is listed at $15.99 at the time of the review and this price given its good performance and with a connectivity of up to 8 fans is justified in my opinion. 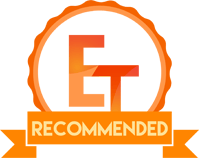 The SST-CPF04 based on our testing comes highly recommended by us. 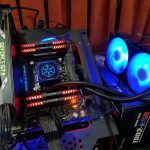 We are thankful to the SilverStone for giving us the opportunity to review their SST-CPF04 1-to-8 PWM fan hub.